On the 12th, my mum took a plane from Singapore to America. The thing was that I was left alone for two weeks. And it was the first time I was living by myself. I had to plan to do chores during the week. Random unexplained noises immediately indicate that my house has been broken into and that I was going to die. The freedom is very liberating but there were moments when I just felt really lonely. And then on the 24th, it was my turn to take a plane (by myself, mind you) to go to America. The last time I flew in a plane was when I was six years old, when I migrated from Paris to Singapore. But I can't remember how that flight went, so I considered this flight to be my "first time" flying. Did I pack too little? Should I pick a window seat or an isle seat? What do I wear for the flight? What if I get hungry during the flight? What do you mean I can't bring water along for the flight??!? ... Oh. I can bring an empty bottle then have the stewardess fill it up during the flight. But why would you ban people from bringing water? What did that one person do to get airlines to make this rule? Which sketchbooks and art materials should I bring? .... Am I packing too much? And then it was time for my flight. I took a plane from Singapore to Beijing, and then from Beijing to New York (JFK airport). 1. Planes make me nauseous, have headaches, and at times make it feel like one of my vein is going to pop. 2. 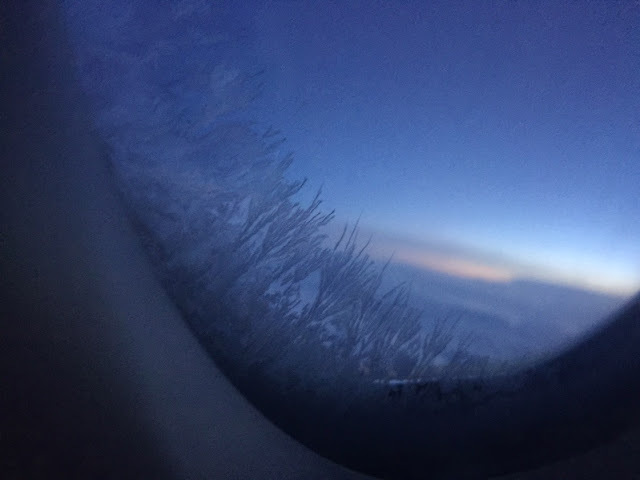 Ice crystallizes on the plane's windows. 5. Flying made me reflect on how much developments there have been in out technology. One of the best moment I had whilst flying was when it was around 3am and I opened the plane's window to see what I could see. And the entire sky was pitch black but there were dozens upon dozens of stars in the sky. And I placed my hand on the window and the glass felt really cold and my hand made a foggy handprint on it. In that moment, I felt so terribly small compared to the vastness of the Universe. It was inspiring, and beautiful, and splendiferous. I hope you will have fun times in US and see a lot of inspiring things. For flights over 8hours I usually take the aisle seat and try to stand up and exercise a little every 1.5h. I took a window seat to be able to see out the window due to it being my first flight. I tried to sleep more during the flight. I couldn't draw during the flight because there was a lot of turbulence. So I read instead. My flight went well. Hopefully the flight home will go just as well.